Since its founding in 1891 by leaders of Richmond’s African American community, Historic Evergreen Cemetery has served as a powerful monument to black achievement, community life, and family bonds. Evergreen is the resting place for thousands of individuals who faced segregation, discrimination, and racial violence while contributing in important ways to the city’s—and the nation’s—vibrant social, political, intellectual, and religious life. Among those who rest here are such luminaries as Maggie L. Walker, John Mitchell, Jr., Dr. Sarah Garland Boyd Jones, and Rev. J. Andrew Bowler. More than 10,000 lesser-known Richmond heroes are buried throughout Evergreen’s 60 acres. We invite you to make history with us and help to honor those resting in this national treasure! 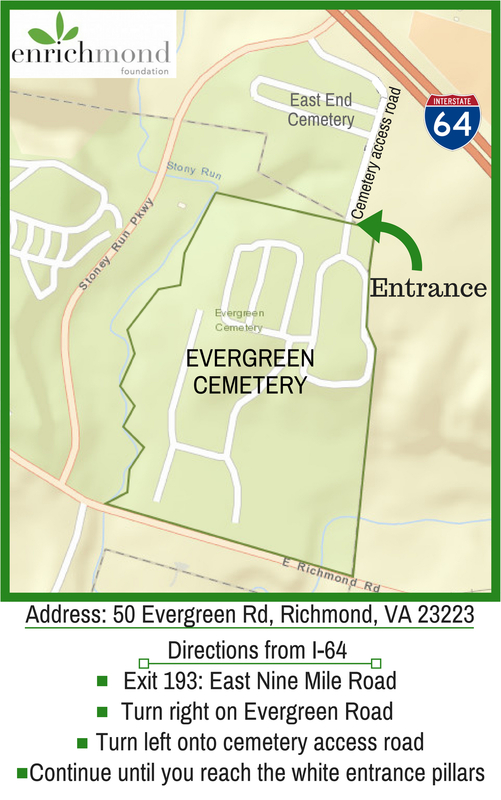 Evergreen Cemetery is located in the East End of Richmond, at 50 Evergreen Rd, Richmond, VA 23223. After turning onto Evergreen Road (also labeled Bulheller Rd.) at the large white sign, please continue driving past East End Cemetery on your right until you drive through two white pillars labeled “Evergreen Cemetery”. Once inside the cemetery, parking is available in two labeled guest parking lots within the cemetery. Please drive to the right once you enter to follow the main loop. For general inquires and help locating your loved one at Evergreen, please contact the Caretaker by email at [email protected], or by telephone: 804.234.3905 ext. 105. If you are interested in assisting with or contributing in any way to the restoration efforts of Evergreen Cemetery, please contact our Volunteer Coordinator by email at [email protected], or by telephone: 804.234.3905 ext. 102. Evergreen Cemetery is a public cemetery, open between dawn and dusk.